Members of Congress were absolutely shocked – shocked! – that the employees of the commercial bank of Wells Fargo had created several million accounts and credit cards that their customers had never asked for simply to meet sales quotas set by the bank and/or to obtain bonuses. But what is going on every single day at the brokerage firms owned by all of these banking giants is that the stock broker (variously called a financial consultant, financial adviser or Vice President of Investments) is able to triple the commission he collects on the bonds he sells you at his discretion. It’s been that way for 30 years, if not longer. Let’s say you are buying a $10,000 corporate bond which the firm is showing on their computer screen with a one point commission. One point means $10 per thousand or a total commission of $100 on a $10,000 bond trade. The honest broker who is truly looking out for the best interests of his client, will do the trade as it appears on the computer screen. But to placate its greedy brokers and its million-dollar producers who can readily jump ship to another firm, the brokerage firm will tolerate the broker tripling the commission to as much as three points or $300 on a $10,000 bond, and sometimes, even more. The broker actually has the ability to go into the computer and change the commission at will when he inputs his trade. The same thing happens on municipal bonds and Ginnie Maes. Over time, that money moving out of your pocket into the pocket of the broker and his firm (the broker gives a split of his commissions to his firm) can make a major difference in your wealth. There is also a massive ripoff taking place in the sale of annuities. Typical commissions on annuities can range from 3 percent to 7 percent. Which annuity do you think the broker is going to sell to you? There is no justification for high fee annuities, other than to incentivize the broker to sell that firm’s product over the product of other companies. Then there are the mutual fund rip-offs. The reason the major brokerage firms do not carry the low-cost passive index funds is because their brokers want the high commission funds which, frequently, pay them trailing commissions, year after year. The above long-tenured ripoffs are why you’ve only read about the Department of Labor imposing the fiduciary rule on brokers for retirement accounts – not all accounts. The Department of Labor oversees Erisa law which governs retirement accounts. Under its new fiduciary rule which takes effect next April, the broker must put the client’s best interests first. (There are a bevy of lawsuits trying to gut the law.) 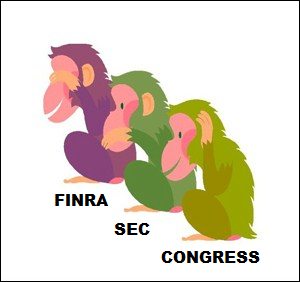 The regulators of the brokerage firms – the Securities and Exchange Commission and their self-regulator, Finra — after decades of watching how these ripoffs play out for the average investor, have failed to take a stand on behalf of the investing public.That fact alone tells you pretty much all you need to know about on whose behalf the SEC and Finra are working. But you have the power to fight back. You can request, before authorizing the trade, for the broker to email you a verification of how much commission or markup he is taking on the trade. In other words, get it in writing.